The Email subscriber receives messages from topics and delivers emails via the SMTP protocol. Note: Email servers may have maximum connection limitations. When an email subscriber sends multiple emails to the same server in quick succession, this limitation may cause emails to be dropped. To fix this issue, adjust the MAX_WORKER_THREADS parameter in the email.properties file, located in <FMEServerDir>/Server/config/subscribers, to a value at or below the corresponding value of the email server. For example, if the email server's connection limit is 20, lower MAX_WORKER_THREADS from 100 (default) to 20. Name - Specify a name for the subscription. Topics Subscribed To - Specify the Topics you want to subscribe to using the drop-down selector. To create a topic and use it right away, click +. SMTP Server - Mail exchange server domain name or IP address used for sending email. 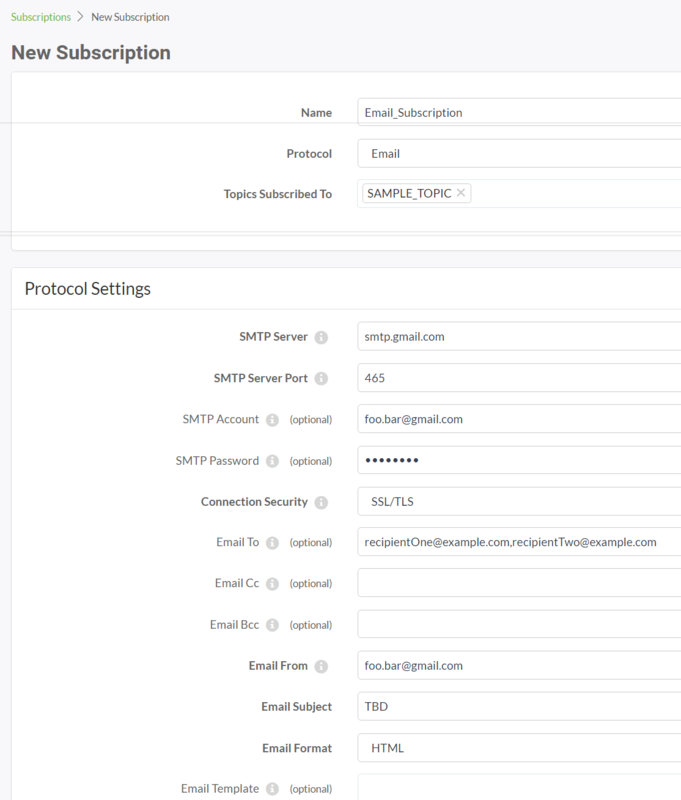 Tip: To auto-populate some fields for common SMTP servers, click Load Template. SMTP Server Port – Mail exchange TCP port used for sending email. If Connection Security (below) is SSL/TLS, specify port 465. If StartTLS or None, specify port 587. SMTP Account – If the SMTP server requires authentication, this is the user name. SMTP Password – If the SMTP server requires authentication, this is the user password. Connection Security - The encryption mechanism used for the connection. SSL/TLS: The connection uses Transport Layer Security (TLS), formerly Secure Sockets Layer (SSL), supported by most common SMTP e-mail servers. StartTLS: An SSL/TLS connection with the e-mail server is initiated using the STARTTLS command. None: The connection is unencrypted. Email From – Corresponds to the "From" field in standard email messages. If users reply to the notification e-mail, it is directed to this address. Email Subject – Corresponds to the "Subject" field in standard email messages. Email Format - The format of the email, either plain text or HTML. Email Template – The message body to use for delivery. This is a template that allows the use of various tags that are replaced with dynamic information before delivery. For more information, see Email Template Language. subscriber_content: Overrides the Email Template setting. Upon receiving this notification, the email subscriber sends an email message, including attachment attachment.txt, to recipient@example.com (no cc's). The subject is This is a sample email. The message body of the email is Hello World. Replies to the email are delivered to sender@example.com.